The ‘elephantine’ jumbo approach of including more number of words in their puzzles in comparison to the non-jumbo versions is also their unique feature. Jumbo perfect bound compilations are known to accommodate a larger number of puzzles too, and hence more number of pages and expected to cost more, but provide decent value for money spent. Buy a single copy or subscription to Family Wordsearch Jumbo magazine. Organized amidst family members, it not only adds value to the knowledge gaining exercise for the family unit as a whole, but also turns out to be a very productive pastime for keeping the mind keen. With the advent of computers, the internet has proved to be a wonderful source of word puzzles and is being used extensively for churning out a wide variety of interesting and innovative puzzles. Domain specific word-search puzzles like nursery words, words relating to pets and care, culinary ingredients and dishes, washing and ‘Good morning’ could be a few amongst the diverse family themes on which puzzles are designed for wider acceptability. 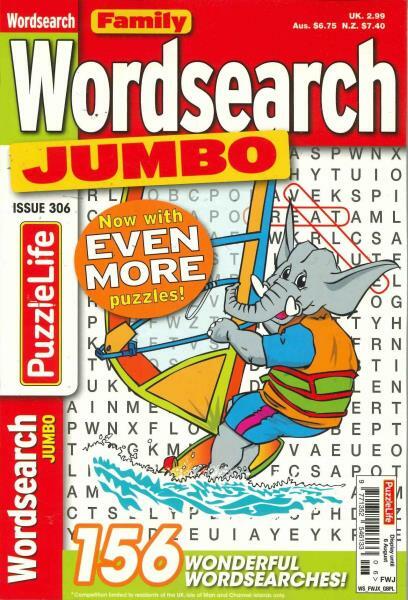 Jumbo versions of the Family Wordsearch magazines are in no way different to the conventional monthly Family Wordsearch ones, except that the puzzles are printed using a larger size of font vis-à-vis the small print puzzles used in the latter, to address the issue of visibility and clarity.